The first time I caught wind of the Galaxy Gear, I laughed heartily. Of course Samsung was trying to make a smartwatch — what haven’t they tried to make over the past few years? It didn’t help that some preliminary reports may have done more harm than good for the Gear’s early reputation. Needless to say, I wasn’t expecting much. But now, after spending a little time with one on my wrist, I’m convinced. I was wrong… but not entirely. Credit where credit is due, Samsung knows how to put a gadget together. I was initially wary of the size, mostly because those leaked images from this weekend pointed to a totally gargantuan device that didn’t actually seem fit for human consumption. But, between the plastic wristband and a surprisingly light main body, I could easily imagine myself forgetting I was even wearing a Gear. It’s definitely heavier than my Pebble, but not nearly enough for me to complain about the difference. Rest easy, folks, your wrists will be well-tended to. Still, the Gear is hardly the sleekest thing you’ll see on store shelves — its aesthetics have more in common with those bulky sports watches than something you’d wear to a nice dinner, a sense of style that only gets reinforced by the built-in pedometer and readily available fitness apps (but more on them later). It’s also worth noting that the camera jutting out of the Gear’s band looks ridiculous on certain colored devices, but it’s just a fashion risk you’re going to have to take if you want to be able to boss your phone around from your wrist. And that 1.63-inch AMOLED screen is no slouch, either. It’s sufficiently readable under harsh event lighting, and that 300×300 panel is perfectly serviceable. Speaking of serviceable, the 1.9-megapixel camera seemed to work just fine — you snap commemorative shots by tapping the screen — but I wouldn’t hold out much hope for quality once you get them off the Gear. There’s still the whole battery thing to worry about, too, though. Samsung says people can get about a day’s worth of “regular use” out of the thing, but no one I’ve spoken to has been able to give me a firm idea of what “regular use” actually means, and I spotted at least one dead Gear during that post-event scrum. Hopefully Samsung had the forethought to under-promise and over-deliver on that front or else this font of positivity will dry up real quick. But, as always, hardware is only a part of the equation. 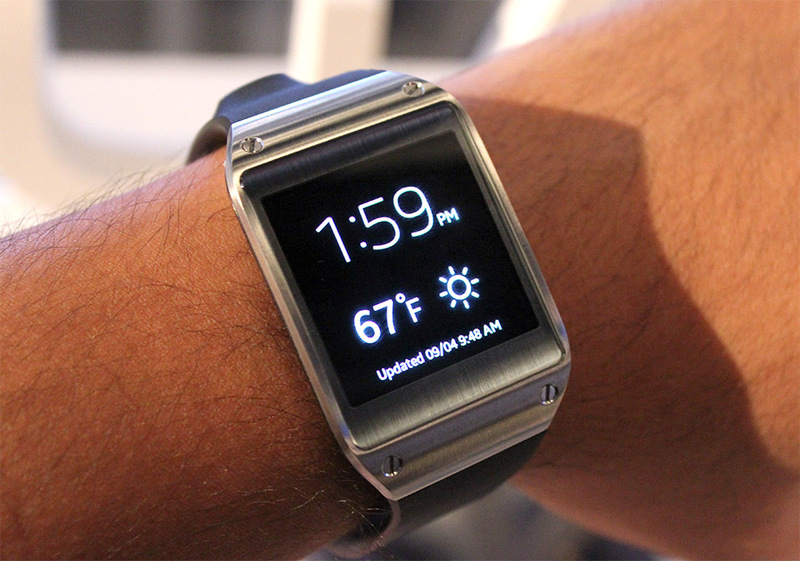 Right now, the Galaxy Gear’s software is simultaneously its biggest liability and its greatest advantage. For one, it’s sort of difficult to use. Navigating the Gear is all based around swipes and taps, and the units I messed around with didn’t always seem capable of keeping up with my commands. Transitions between pages could be sluggish and jerky unless you made it a point to move really slowly. S Voice too was similarly jerky, though in fairness we were in a crowded room full of gadget nerds clamoring for a turn with the thing. And, perhaps most troubling, the Gear didn’t always fire up that screen when I lifted my arm to peer at it. So yes, Samsung still has plenty of fine-tuning to do, and I’m willing to forgive some pre-release hiccups as long as they get sorted out before launch. So why the praise then? Because Samsung managed to coax more than a few developers into creating simplified versions of their apps for the Gear. There are the usual suspects like RunKeeper (which keeps a running tally of your time, among other things), and more curious fare like Path (which lets you create new moments for your feed instantly) and Vivino (I wish I had a wine bottle around to scan). Samsung says it’ll have about 70 such apps ready in time for the Gear’s launch, but prolonged developer support is what’s ultimately going to make or break the Gear as a platform. But wouldn’t you know it, there’s a caveat there, too. You can only have 10 apps loaded onto the Gear at any one time, which is much more of a hassle than it seems. I was ready to completely dismiss the Galaxy Gear as a fool’s errand, a knee-jerk reaction to some persistent rumors made by a company that sometimes seems to have more money than sense. And even now, I’m not completely convinced that Samsung is on the right track. Limiting compatibility to a single device (even one that’s probably going to sell in ridiculous quantities) seems awfully problematic given Samsung’s generally slow record for software updates. But having said all that, I really think Samsung is onto something here. For the briefest of moments while playing with the Gear, I felt a pang of jealousy. My Pebble is pretty damned basic by smartwatch standards, and I thought what limited functionality it brought to the table was plenty for me. But now I can have a package that does much, much, much more for a negligible increase in weight. How is a strident dork like me supposed to pass that up? I probably can’t. The bigger question is whether regular people latch onto this thing the way Samsung is hoping it does. For a gadget that, in exchange for $299, lets them accomplish a fraction of what they could if they had just pulled their phones out of their pockets? We’ll see.